These large frogs can grow up to 16 cm long. Females are much larger than males. Ornate horned frogs hunt by waiting for prey to come near. They have a huge mouth and a big appetite, eating anything that they can, including mice, small lizards, insects and spiders. During the dry season, they burrow in the ground and hibernate for up to 6 months without eating. At breeding time, females lay up to 2,000 eggs in water. After hatching, it only takes about two weeks for the tadpoles to turn into froglets. Ornate horned frogs are found in Argentina, Brazil and Uruguay, but their numbers are dropping due to habitat loss and collection for the pet trade. 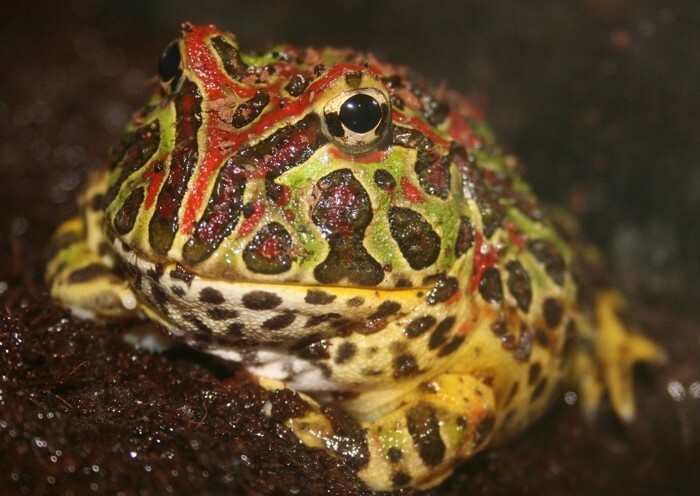 Are there any other interesting facts that you would like to share about ornate horned frogs?